Gerry Henkel has become the major supplier of kanteles to North Americans in the last fifteen years. He builds traditional Finnish kanteles in a small shop in the woods a few miles north of Lake Superior near Duluth, Minnesota. He strives to build quality instruments that will bring joy to the players and listeners. He's not a factory - he approaches making the instruments as a craft and an art, not a "product". The goal of his work is to build instruments that he enjoys making and that a buyer will enjoy playing. Previous to making Finnish folk music instruments, Gerry was the editor of The Finnish American Reporter, a national publication for North Americans of Finnish descent about Finnish and Finnish American culture. He is currently the editor of New World Finn, a quarterly journal exploring Finnish culture (www.newworldfinn.com). 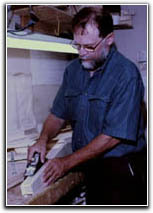 Gerry has also been a woodworker for over thirty years - he was a builder and remodeler of homes, and a cabinetmaker. His love of Finnish culture and its music, and his woodworking skills have come together in the building of kanteles. 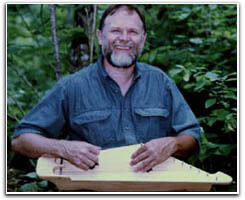 In the winter of 1998, as a recipient of a Finlandia Foundation Grant, Gerry traveled within Finland and immersed himself in its "kantele culture". There he spent time with a master instrument maker, Rauno Nieminen, in Ikaalinen, Finland, and with other kantele builders in Veteli and Leppävirta. He also visited with players and teachers in order to better understand the needs of kantele musicians. As of 2009, over 1900 of his instruments are in the hands of musicians throughout the United States and Canada, Japan, Australia, and Europe. His work has been exposed to the public in a short documentary produced by WDSE-TV of Duluth, Minnesota for their Venture North program (May 1996), other local television stations, Minnesota Public Radio, and in numerous newpaper and magazine articles. In 1997 he was named a Minnesota Folk Artist and again in 1999 he was cited by the Minnesota State Arts Board for "preserving the time-honored tradition of creating Finnish folk instruments". In 2008, he was named an honorary member of Finland's national Kantele Association. "During the past two years I have ordered all the kanteles for my students at San Diego State University and the University of San Diego from Gerry. I have also chosen to use Gerry's kanteles in my performances because the sound of his instruments is excellent." - Merja Soria, graduate of the Sibelius Academy in Helsinki Finland; instructor in music at San Diego University, and the University of San Diego; performer (vocals, accordians, kanteles) throughout the US and Finland. "I have examined Gerry's kanteles, and I have found them to be well-built, resonant and visually pleasing." - Oren Tikkanen, producer of award-winning (American Folklife Center at the Library of Congress) recordings of Finnish American music; writer about Finnish American music; and popular performer of traditional Finnish American and Finnish music. "I'm so impressed with what you have done, where you've taken your gifts and magic. I mean it - for you, as also do I, bring an American approach and interpretation to what we do. You have that liberal vision in how you see your instruments. And that is unique and ultra-hip." 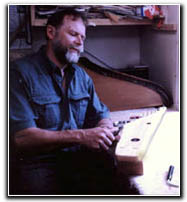 "To my knowledge, Henkel is the only professional kantele builder in North America. He specializes in the oldest form of the kantele, those carved from a single piece of wood. His carved kanteles are excellent."